"Emil Gilels played a sonata by Scarlatti at his first public concert in 1929 and included them in his tours to the West in the 1950s. These recordings present a splendid group of the composer’s widely contrasting moods. 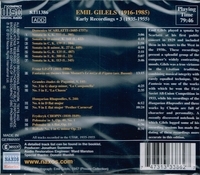 Gilels was a true virtuoso in the Lisztian tradition, combining musical integrity with rarely equalled technique. The Fantasia was one of the works with which he won the First Soviet All-Union Competition in 1933, while his recordings of the Hungarian Rhapsodies and three works by Chopin are full of character and personality. A recently discovered notebook in which Gilels logged some of his recording sessions has made the dating of these recordings more accurate in this edition." "Along with Sviatoslav Richter (to feature later) Emil Gilels was regarded as the greatest of the Soviet “Emil Gilels, one of the world's great pianists and, in 1955, the first Soviet musician to perform in the United States since Sergei Prokofiev in 1921, was a stocky man with a shock of sandy hair and short, stubby fingers, uncharacteristic for a pianist. But his greatness was widely recognized. Howard Taubman of THE NEW YORK TIMES proclaimed him a ‘great pianist’ on the occasion of his New York debut at Carnegie Hall on Oct. 4, 1955. After his first New York recital a week later, Harold C. Schonberg invoked the phrase ‘little giant’, the term the critic W. J. Henderson had used for the pianist and composer Eugen d'Albert at the turn of the century. Mr. Gilels continued to receive such encomiums throughout his career, both in the Soviet Union, where he had taught at the Moscow Conversatory since 1938, and in the West. Altogether, he made 14 American tours, the last in 1983. On the occasion of his last New York recital, on April 16, 1983, Donal Henahan wrote in THE TIMES of his ‘formidable, high-finish technique and beautiful control of nuance’.